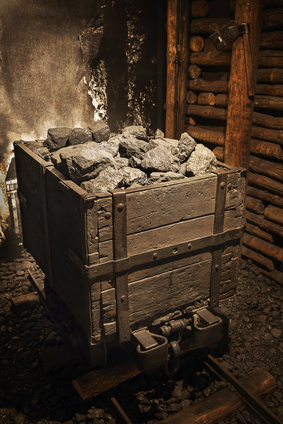 One of the greatest challenges facing the mining industry is the separation of unwanted material generated by the extraction process from the valuable material. Mining, whether done through open seam or underground means, creates a huge amount of waste product in the form of worthless or low value minerals and unusable man-made materials. These materials can be extremely difficult to separate from the valuable materials miners are after. Perhaps the most efficient way of separating these materials is through magnetic separation. Magnetic separation is the process of using magnetic force to remove metallic or ferrous materials from a mixture. Magnetic separation machines consist of a vibratory feeding mechanism, an upper and lower belt and a magnet. The bulk material is fed through the vibrating mechanism onto the lower belt. At this point, the magnet pulls any material susceptible to magnetic attraction onto the upper belt, effectively separating the unwanted metals from the rest of the bulk. Magnetic separation has been used in the mining industry for more than 100 years, beginning with John Wetherill’s Wetherill Magnetic Separator, which was used in England in the late nineteenth century. Magnetic separation is most commonly used in the mining industry to separate “tramp ore,” or unwanted waste metals, from the rest of the bulk material. Tramp ore typically consists of the man-made byproducts created by the mining process itself, such as wires from explosive charges, nuts and bolts, nails, broken pieces from hand tools such as jack hammers and drills or tips off of heavy duty extraction buckets. Magnetic separation machines are usually placed at the beginning of a mine’s materials processing line to remove tramp ore before it can cause harm to “downstream” equipment such as ore crushers and conveyor belts, which can be easily damaged by metal shards or other sharp objects. Most magnetic extraction systems are designed to be easily retrofitted onto existing production and conveyor systems, so major equipment relocation is unnecessary. The type of magnetic separator used by a mine depends on what material they are extracting and how much tramp ore is generated by their process. As a result, separators of different magnetic flux, or power, can be used. There are 2 types of magnetic separators; electromagnetic and permanent. Electromagnetic separators generate a magnetic field by switching power from alternating current to direct current. Electromagnetic separators are useful for removing large pieces of tramp ore from the bulk material. These separators are typically suspended over a conveyor belt and draw the unwanted material upward. Electromagnetic separators are easy to clean as removing the tramp ore that they separate from the bulk is as simple as turning off the power that creates their magnetic field. Permanent magnets consist of materials that generate their own magnetic field. Though not as powerful as electromagnetic separators, permanent magnets are better at attracting strongly magnetized materials such as nickel, cobalt, iron and some rare earth metals. Some permanent magnets are now being made with rare earth metals that have the ability to attract even stainless steel, which is typically not susceptible to magnetic pull. In order to clean permanent magnets, a stainless steel scraper must be used to remove any metal parts from the magnet’s surface. Magnetic separation definitely is one of the most important parts of this process. I think magnetic separators are often taken for granted when it comes to processing, whether that processing is in mining or in food processing. Many people don’t even know the work that goes into making food safe or mining materials pure.